Collaboration: Efforts by two or more organizations to create a durable, pervasive relationship that permits them to achieve mutually beneficial results. Use for continuity and consistency of information sharing, program coordination, and joint planning. Administrative Consolidation: Sharing, exchanging, or contracting of administrative functions to increase the administrative efficiency of one or more of the organizations. Use for continuity, expense savings, professionalization of processes, and colocation. Joint Programming: The joint launching and managing of one or more programs to further the mission of the participating organizations. Use to achieve complementarity, portable programming, and cross sector initiatives. 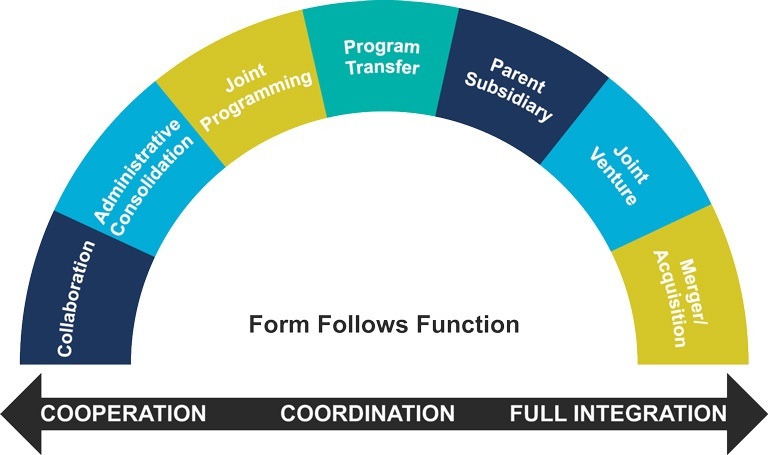 Program Transfer: Occurs when one organization spins off or transfers administration of one of its programs to another organization. Use to address mission creep, post demonstration project, for a “lifeboat,” or when host organization is going out of business. Parent Subsidiary: Preserves the visibility and identity of the organizations while combining some of the partners’ administrative functions and programmatic services. Use when identity is paramount as with culturally specific organizations. Use when there are organizational assets that can’t be disassociated from the organization. Joint Venture: Creation of a new organization to further a specific programmatic or administrative aim of two or more organizations. Use to share governance, leverage reduced costs, eliminate duplication, and achieve economies of scale. Merger / Acquisition: Integration of all programmatic and administrative functions of multiple organizations. Use to achieve administrative efficiencies, preserve services or achieve program synergies, increase geographic reach, grow or go to scale.